The next episode of Rhode Island Classroom airs Thursday, May 25 at 8 p.m. The episode will encore on Saturday, May 28 at 11 p.m. and Sunday, May 29 at 6 p.m. as part of the ongoing Rhode Island PBS series, Rhode Island Stories. Episode #107 visits with Jim Purcell, the commissioner of postsecondary education, to discuss the state of the state's higher education: are Rhode Island colleges and universities making the grade? Purcell also talks about new funding initiatives proposed by the governor and how those will be implemented. Finally, viewers take a virtual tour and hear the latest about the construction of the new URI | RIC nursing education center in Providence. In another segment, Rhode Island Classroom reports on the aftermath of the recent string of bomb threats at RI schools. Host Nicole Muri sits down with the state police to find out how they respond, and how they keep our children safe going forward. The segment includes a demonstration by the state police bomb-sniffing K-9 unit. Also, a psychologist suggests ways parents can talk to their children who may be frightened after a bomb threat and evacuation at school. Finally, a new law signed by President Obama will increase access to environmental education for K-12 students. Rhode Island Classroom heads to the water's edge to find out what that means for local schoolchildren in a program of hands-on environmental education in collaboration with Save The Bay. Rhode Island Classroom explores the latest technology, lessons, and people who are making the grade in Rhode Island's Kindergarten through grade 12 classrooms. Produced by WSBE Rhode Island PBS, Rhode Island Classroom is a half-hour quarterly series that introduces stand-out teachers who are inspiring students, break-through courses offered in area schools, and new, exciting programs that are motivating students to succeed. WSBE Rhode Island PBS transmits over the air on 36.1; on Rhode Island cable: Cox cable 08/1008HD, Verizon FiOS 08/508HD, Full Channel 08; on Massachusetts cable: Comcast 819HD (Comcast SD subscribers check local listings for channel), Verizon FiOS 18/518HD; on satellite: Dish 36/7776, DirecTV 36. This panel of education experts will explore the state of Rhode Island schools and where the Ocean State is headed with its education system. • Education funding formula – does it need to be adjusted? • English learners – should there be additional funding? WSBE Rhode Island PBS transmits standard-definition (SD) and high-definition (HD) programming over the air on digital 36.1; on Rhode Island cable: Cox 08 / 1008HD, Verizon FiOS 08 / 508HD, and Full Channel 08; on Massachusetts cable: Comcast 819HD and Verizon FiOS 18 / 518HD; on satellite: DirecTV 36 / 3128HD, Dish Network 36. Based on a popular walking tour, noted Rhode Island historian Tim Cranston narrates Stories of the Sea Captains' Homes of Wickford. Using the fine homes to tell the history of Wickford village, Cranston describes the state's more colorful mariners who lived in them, as well as how Wickford village began and how it flourished across the centuries. The film makes its debut on Rhode Island PBS on Thursday, May 5 at 8 p.m., with encores on Saturday, May 7 at 11 p.m. and Sunday, May 8 at 6 p.m. as part of the ongoing Rhode Island PBS series, Rhode Island Stories. As our tour guide, Tim Cranston also provides broader perspective in Stories of the Sea Captains' Homes of Wickford about the village's relevance to the Triangle Trade, the Revolutionary War, Rhode Island's colonial past, privateering and piracy, the Victorian Gilded Age of Newport, transportation and commerce in 18th and 19th Century New England, and the early fishing and boating industries in the region. The documentary is the work of Rhode Island filmmaker Edward Brassard (Maple Syrup in Rhode Island) and California-based film editor Gloria D'Alessandro. White House Chronicle is a public affairs news program told with a sense of humor. "From our town to your town, we explain politics, making it easy to understand." About once a month, the White House Chronicles features a special edition, Story in the Public Square, "where storytelling meets public affairs." Co-hosted by Jim Ludes of the Pell Center at Salve Regina University in Newport, and G. Wayne Miller of The Providence Journal, the show invites storytellers to discuss and examine their works and the impact they are having on public life. Story in the Public Square recently featured New York Times writer Dan Barry in a discussion of his upcoming book "Boys in the Bunkhouse." White House Chronicle airs Sundays at 11:30 a.m. on Rhode Island PBS (digital 36.1) and at 7 p.m. on Learn (digital 36.2). “With White House Chronicle, I wanted a comfy couch of a television program where viewers could sit back and learn something new, or think about something in a new way,” said King, who is also the program's executive producer and host. King also wanted viewers to meet new people - particularly the many talented print journalists in Washington who rarely, if ever, appeared on television. Over the years, a few of them talent-scouted by White House Chronicle have gone on to become TV fixtures. As host of the program, King ventilates the issues of the time. He opens each episode with “a few thoughts of my own.” His un-Telepromptered commentaries range from serious to hilarious - the big challenges for big engineering in the wake of the Gulf oil spill; running a small business (he ran a publishing firm for 36 years); taking his father’s advice not to become a copper miner in Zambia; and making proper tea. “Unlike politics, tea is very forgiving; just add more boiling water to the pot,” he said. Viewers look forward to King's commentaries in much the same way viewers looked forward to beloved British broadcaster Alistair Cooke’s commentaries preceding PBS's Masterpiece Theater. At a time when network television has a deficit of original thinking, “White House Chronicle” has a surfeit. 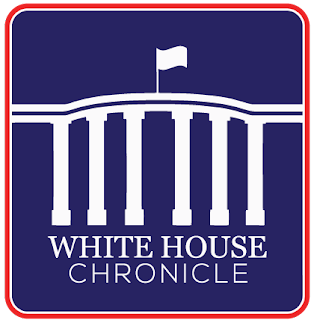 White House Chronicle airs nationwide on some 200 PBS and public, educational and governmental access stations; and worldwide on Voice of America Television. On WSBE, White House Chronicle airs Sundays at 11:30 a.m. on Rhode Island PBS (digital 36.1) and at 7 p.m. on Learn (digital 36.2). WSBE Rhode Island PBS transmits over the air on 36.1; Rhode Island cable: Cox cable 08/1008HD, Verizon FiOS 08/508HD, Full Channel 08; Massachusetts cable: Comcast 819HD (Comcast SD subscribers check local listings for channel), Verizon FiOS 18/518HD; satellite: Dish 36/7776, DirecTV 36. WSBE Learn transmits over the air on 36.2; Rhode Island cable: Cox 808, Verizon 478, and Full Channel 109; Massachusetts cable: Comcast 294 or 312. Off the shores of New England, in a region steeped in old maritime tradition, comes a modern wave of big ships, energy industries, and a changing climate, now testing the limits of an already crowded sea. But in a pioneering trial of far-sighted planning—pushed by blueprints for offshore wind energy—established residents and new are coming together to keep their ocean and livelihoods alive. 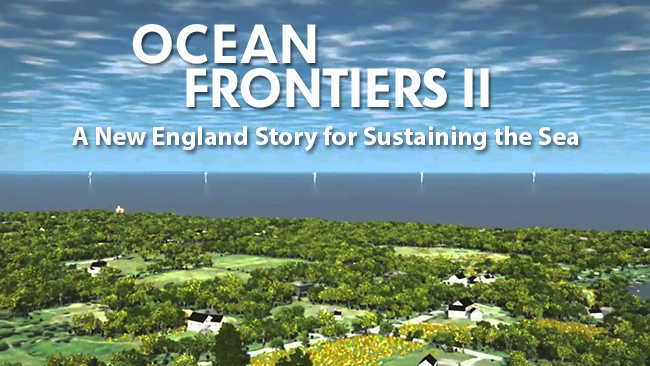 Ocean Frontiers II: A New England Story for Sustaining the Sea chronicles the painstaking path of engaging Rhode Island stakeholders – commercial fishermen, environmentalists, members of the Narragansett tribe, academics, and government officials – to build an unprecedented collaboration to properly site the Deepwater Wind project off the coast of Rhode Island. Employing science and collaboration, the process of consensus building and cooperation among a wide range of stakeholders yielded the first off-shore wind turbine farm in the United States. Sited three miles southeast of Block Island, the renewable energy zone was mapped for the Block Island Demonstration Wind Farm, a 5-turbine project to power 17, 000 homes, and scheduled to come on line in 2016. Scientific data was collected from studies of marine life habits and habitats, undersea terrain mapping, and various inventories of resources such as submerged cables, pipelines, unexploded ordinances, disposal sites, aquaculture areas, turtle and whale migratory paths, as well as recreational fishing areas and other coastal resources. Rhode Island’s combination of science and collaboration served as a model for the Northeast Ocean Data Portal, which is used to shape the permissions and constraints on developers filing proposals in New England – and the country. Rhode Island’s experiences serve as an important milestone for all who care about and make their livelihood on the ocean. 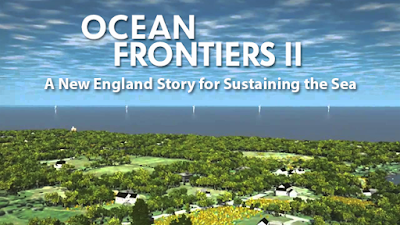 Ocean Frontiers II: A New England Story for Sustaining the Sea airs on Sunday, April 17 at 6 p.m., as part of Rhode Island Stories, the ongoing Rhode Island PBS series that features independent documentaries with a strong Rhode Island connection. This morning on The Rhode Show, host Will Gilbert chatted with Rhode Island PBS President David W. Piccerelli about An Evening Uncorked! (April 9 at 7 p.m. at the Pawtucket Armory). In the delicious kitchen segments, LuAnn Battista of Luigi's Restaurant and Gourmet Express (1357 Hartford Avenue in Johnston) prepared Pan-Seared Sea Scallops with Balsamic Triple Sec Raisin Medley glaze, served over creamy mashed cauliflower - oh my! Michaela Johnson and Will Gilbert sample the dish. Low calorie and gluten free, the small bites version of this delicious regular item on Luigi's Amalfi Coast Menu for Healthy Living regular menu item will be served at An Evening Uncorked!